Since the start of the Eyjafjallajökull eruption there has been much speculation about an eruption of its larger neighbour, Katla. In a report published today, experts from the newly formed UCL Institute for Risk and Disaster Reduction warn that with the high frequency of eruptions of Katla, an eruption in the short term is a strong possibility. The authors add, however, that an eruption of Katla is likely to be preceded by new earthquake activity. Presently there is no such activity under Katla, but there may only be as little as a few weeks to a few months of anomalous activity before an eruption starts. In the report, earth scientists, engineers, transport experts, statisticians, atmospheric modellers and ethicists have brought together their most recent data and thinking on Icelandic volcanic activity and its wider consequences. It represents the fruits of the first project of UCL's new multi-disciplinary Institute for Risk and Disaster Reduction, which has been established to promote understanding of the complexity of risk and to reduce the impact of disasters through collaborative research, teaching and knowledge exchange. Entitled 'Volcanic Hazard from Iceland: Analysis and Implications of the Eyjafjallajökull Eruption', the report concludes that future moderately to highly explosive Icelandic eruptions combined with appropriate weather conditions are highly likely to cause a repeat of the recent air transport disruption. The authors note, however, that due to unpredictability of volcanic activity and weather conditions it is difficult to say when disruption will occur and at what scale. The report is also critical of the response to the Eyjafjallajökull eruption, describing it as entirely reactive and therefore less effective than it should have been. This was primarily a function of the failure to recognize in advance the potential threat presented by volcanic ash clouds from Iceland. The situation was made worse by the inflexible nature of existing aviation protocols and by the absence of any pre-existing agreement within the aviation community on safe ash levels. The report recommends that to avoid chaos, ill-feeling and exploitation, regulation should be considered to control the actions of organisations such as airlines at times of emergency. This might include approval of night operations at airports, insistence that no plane flies with empty seats if passengers with valid tickets are stranded, and no increase in fares during the affected period. The impact of the eruption on airspace could have been predicted and better prepared for as the growing problem of serious aircraft-ash cloud encounters has been recognised for nearly 30 years. Similarly, the potential for ash clouds, specifically from Icelandic volcanoes, to interfere with air traffic in UK, European and North Atlantic air-space was appreciated by the aviation industry well before the start of the Eyjafjallajökull eruption. 1. The potential threat presented by volcanic ash to aviation should be added to the National Risk Register. 2. National capabilities for measuring and predicting the extent and character of volcanic ash in and around UK airspace should be enhanced. 3. As the newly defined safe limits of ash are ad hoc and arbitrary and cannot be scientifically justified, there is an urgent need to determine a range of robust, best estimate safe levels of ash for a wide range of situations, aircraft, engine types and pilot response. This will cost time and money and will require commitment from the aviation industry. 4. Mechanisms should be put in place by stakeholders so that a communications centre can be established, as and when required, in order to advise the public during future airspace closures. This would avoid the large-scale confusion, delay and expense of individuals attempting, without success, to contact individual airlines, regulators and other bodies within the aviation community. Efforts should be made to enable such a communications plan to make use of media resources in order to maximise communication of objective advise and information. 5. At a national level plans should be developed to deal with the long-term grounding of aircraft with consideration given to the financial impact on stakeholders as well as arrangements for repatriation of travellers. While such contingency measures are not inexpensive, they would likely have saved the airline industry alone a good fraction of their £1 billion estimated economic loss arising (to date) from the Eyjafjallajökull eruption. The main cost of such measures should be seen, therefore, in the context of investment rather than a recurrent cost. Professor Peter Sammonds, Director of the Institute for Risk and Disaster Reduction, said: "Volcanoes in Iceland have now become a key concern for the UK. We need to know how these ice-capped volcanoes may disrupt air transport in the future, and that means understanding better the volcanology, the ice physics and meteorology, as well as assessing the risk of ash to aircraft engines and systems." 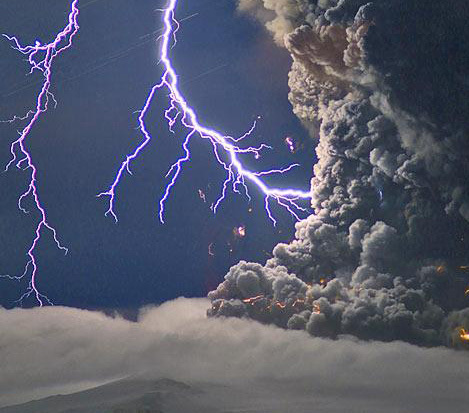 Dr Stephen Edwards, Aon Benfield UCL Hazard Research Centre, said: "Eruptions comparable to the 2010 Eyjafjallajökull event occur in Iceland every 20 to 40 years and the present eruption is not unusual and may continue for many more months to a year or more. The transport of ash from Iceland to northwestern Europe is a consequence of north to north-westerly airflow from Iceland, which although atypical is not unusual. Consequently, further disruption to air transport should be expected as long as the eruption continues with explosive episodes during periods of north to north-westerly airflow." Professor Bill McGuire, Director of the Aon Benfield UCL Hazard Research Centre, noted that: "Serious failings remain in relation to raising awareness of natural hazards capable of regional or global impacts. In this context, I again urge action in light of the principal recommendation of the UK Government's 2005 Natural Hazards Working Group, vis a vis the establishment of an international science panel to catalogue, evaluate and raise awareness of, natural hazards with the potential to affect more than one nation." Carina Fearnley, Aon Benfield UCL Hazard Research Centre, said: "The severe disruption to European airspace in April from Eyjafjallajökull's ash clouds reflect a lack of integration between the monitoring, warning and risk management systems. On the one hand the monitoring system needs improved atmospheric ash monitoring methods; on the other the risk management system requires scientifically determined safe ash concentration thresholds, and needs to consider the European context of crowded flight paths. In contrast to these two elements, the warning system functioned effectively as a communication network." Reducing global risks and disasters presents a colossal challenge that requires coordinated and collaborative action. UCL is uniquely well placed to lead research in risk and disaster reduction, with at least 70 academics across 12 departments and 7 faculties involved in world-class research, teaching and practice in the field. The Institute for Risk and Disaster Reduction, responding to the UCL Grand Challenges, will bring together this wealth of knowledge and expertise, and through research, teaching and knowledge exchange aims to overcome the barriers to understanding risk and reducing the impact of disasters.